This is so NOT the world's finest fruitcake. Who would, honestly, order fruitcake from the Wisconsin Cheeseman? I advise against it. I received the 20 oz. loaf after paying $29.95, about 8 dollars shipping and handling. Well, to make a long story short, this is the same turnip-laden cake I got from Swiss Colony. I compared ingredients and although the order might be slightly different between the two, the general contents, down to turnips and turmeric, are identical. Upon further perusal, I see that both companies "distribute" these cakes, don't necessarily make them. As to who actually DOES make the cakes, the Wisconsin Cheeseman customer service department could not respond. So if you want to know how it tasted, see this review here. And don't buy this cake. There are much better ones out there. 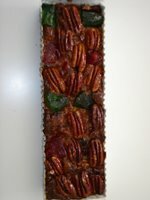 Swiss Colony maked their own fruitcakes and distributes them to Wisconsin Cheeseman.